I'm one of those people in this world fortunate enough to have been gifted with most of my kitchen appliances and such when I was married so many years ago. Every item from my grandmother's WWII aluminum cake tin and her enormous aluminum cookie sheet to the toaster oven and electric skillet, have been used often and well. All are still working but the upright mixer hubby bought me that second Christmas we married. After 22 years, its motor just recently passed on to appliance heaven. Even though I began my married life with lovely, useful gifts, one thing I didn't have and needed dreadfully and my budget was too tight to accommodate—a small cutting board/butcher-block. That's when a knowing sister stepped in. I'll never forget it. My oldest sister showed up unexpectedly and took me shopping. Bless her heart, her budget was just about as tight as mine was at the time—meaning none-existent, but she took me anyway. I think it was her first memories of keeping house and cooking that prompted her. There are always little things that are desperately needed in every kitchen. The little cutting board was a major purchase for either of us at $8. I was so thankful to have it and so grateful to my sister that I just about cried. What made me think of it today was that I noticed it was way past time to give it a good rub in oil. I'd just finished peeling and chopping up a mass of potatoes for the evening meal and scrubbed up the little butcher-block. As it finished air-drying on the counter, I prepped other things, then pulled out the vegetable oil and poured a dollop in the center and rubbed it in. I recall Melly reminding me to do this every so often. I got to thinking about my other kitchen stuff. I was given a blender which was used on and off, then given away to someone else in need. I think over the years I've bought four or five blenders and I always end up giving them away—because others use them more than I. I just did buy another one, a cheapie one for this summer as the kid suddenly loves 'fruit smoothies' even though the ice has to be crushed BEFORE it goes into the blender. I think after this summer it will end up with someone else again. There was a crockpot I began my married life with and I used it often when I was first married because I was still within distance of coming home at lunchtime either to start it or to check it. Later on, when the distance became too much, I was leery about leaving it on so long a time without being able to come home to check on it. That crock-pot ended up finding a new home. My middle sister, Betsy, gave me another crock-pot a few years back—again, I wouldn't use it for the same reason, and an occasion came up when she needed it, so it found the right home. In recent years, I did go buy a crock-pot, not for the weekdays, but for the weekends—for a lazy Sunday or a busy Saturday. Where I could be home, but the dinner didn't take much fussing over. I've learned to love that little thing. One of the last years my mother was alive, I remember she asked me what she should get we girls for Christmas. She asked the wrong child because I knew exactly what I wanted for Christmas as a kitchen gadget—a rice steamer, again out of my budget at about $30. Okay, so it could steam vegetables too, but it was for the steamed rice I wanted it. At the time, I'd recently been able to try rice steamed that way and it was just like you'd get with Chinese takeout—WONDERFUL and perfect. Thus, all three daughters received a rice steamer for Christmas. I think Melly enjoyed hers, but Betsy's died a bad death. I still have mine and use it either for the rice, or steamed veges—and I think of my mother every time I use it. Then there was the electric frypan I received as a wedding present from my mother, I especially loved. My favorite thing to cook in it was what she'd taught me at home—an old-fashioned pot roast with all the potatoes, carrots, and onions. Hey, and it had Telfon® and was dishwasher safe! I was in heaven. I used it for over twenty years without any problems but over the last five years not as much. Again the call came for an emergency, it found a new home—read Betsy for she used hers more often than I. One of the items in my kitchen that has seen daily use for nearly 23 years is the toaster oven. They were massively expensive back then but I had my heart set on one. Especially for toast, more importantly, cinnamon raisin toast—Grandmom's style. Which meant the bread was buttered, sprinkled liberally with a cinnamon-sugar mixture and broiled. And Grandmom came through for me. I've used that toaster oven to do many things and every time I use it, I think of her—along with all the other kitchen gadgets she's passed down to me. Then there were the items I'd bought long before I married and paid off over time, the set of china and crystal in smoky rose and smoke, the WonderWare® cookware, and Oneida flatware. Back when I graduated high school, the salesmen used to come around and hijack a young woman's fancy about keeping a home. Thus I paid $$ over almost five years, well after I was married for that stuff. I still have it, and it's great. However, had I known how rarely I'd use the china and crystal, I might have given it a pass. Yet, there were several times when I really needed to provide as impressive a setting as I could, and I was grateful to have them. However, my favorite purchase of myself in the kitchen was my two caste iron pans, one a round griddle and one a skillet. I was dating my hubby back then and he had NOTHING in his kitchen. There was a huge sale and for the price, we thought we were stealing it when we left the store. I had espoused caste iron so much that you would have thought I'd invented it and knew all about it. At the time, about all I did know was that my mother used her caste iron skillet almost daily and it was so perfect for so many things; but she'd had hers for years and years and it was seasoned. I'd bought virgin caste iron and knew it had to be seasoned. I quickly made the important call—to my mother, and found out the skinny on how to truly season caste iron. Sidebar—You can look up many differing ways to season a caste-iron piece of cookery, but this is likely the most unique you'll find anyway and it DOES work. Peel a bunch of potatoes—(what you do with the actual potatoes matters not—boil them, fry them, bake them—just don't waste them—we don't need the actual potatoes for this—just the peelings). Take that heaping helping of peelings with a little water and slowly cook them in the skillet over about 30 minutes. After that, DO NOT RINSE the skillet, but gently wipe it thoroughly dry with a paper towel. Then apply a very light coat of vegetable oil, preferably Crisco®. Thereafter, the first few uses will have a strong metallic odor. When you clean it, use normal dishwashing soap, rinse, dry with paper towels and recoat with the oil. This will take multiple reapplications until it's seasoned. Once the pan is seasoned, it will become your best ally in the kitchen and your best kept secret. Later there were the salvaged "Pomona" plates by WindsorWare (Johnson Brothers, England) after Hurricane Gloria in '85. Hubby was clearing away the debris from some totally destroyed ocean front condos in Ocean City at the time and came home with 7 dinner plates and 5 sandwich plates. I think we still have 5 left in total. Those also became well loved and used items. I felt they were survivors that came to a good home. I love all my kitchen items and normally all have a history. Almost ten years back the excitement over bread machines ran rampant throughout the nation (in today's world bread is considered a sin via "Atkins®"). However, back then, the memory of Mother's fresh baked bread was irresistible. And for me, it still is. We ended up going through 3 bread machines. The first one, we simply wore out. We made bread not just for us, but everyone we knew and saved up and bought others the same machines so they could enjoy it as much as we did. The second one had a mechanical problem, we traded it in under warranty and the third one lasted a long time. Granted, it wasn't used as much as the first one, but it did the job until it too went to appliance heaven. I recently replaced that with the mighty "Z" machine with two beaters and an extra-strong belt. It is heaven on wintry weekends just for that yeasty warm scent. For me, it brings back Mom's breads, the ones she slavishly kneaded and allowed to rise near the woodstove. I can almost here her singing in the kitchen. Silly me has a favorite kitchen paring knife and sharpener. The kid looks at me boggle-eyed when I peel potatoes and she uses a peeler—knowing I wouldn't yet trust her with the knife I keep sharp enough to take off a finger or three (she's scared of it and I'm glad). The knife I bought myself and is a solid piece of good steel from end-to-end and has a hefty, balanced, stalwart in feel and fits my hand exceedingly well. May everyone who cooks have a such a faithful sharp knife. The latest kitchen replacement is my mixer, if you don't count the buzzing little Black & Decker blender for the kid's smoothies, is a traditional KitchenAid®. I considered this a major purchase. No, I don't need the dough or grinding attachments, but learning how to use this type of mixer took a few tries. I will admit, as for mixing power, there can't be anything BUT a KitchenAid®. For the first time, I was actually able to beat egg whites into stiff peaks and then fold them into a rich, homemade cake batter (Melly, don't have a stroke). Further, with this machine, you don't have to 'pre-mash' your potatoes with a dough cutter before adding the butter and sour cream—this thing will whip them up righteously. However, despite my pet little paring knife, mixer, and bread machine, I have to admit, my preferred items in the kitchen I hold dearest are the oldest ones, the ones either gifted to me or handed down to me. I especially prize my grandmother's old bottle-top opener which was date-stamped, Nov. '33. I plan on handing that little item down to my grandchild—if ever I live that long. 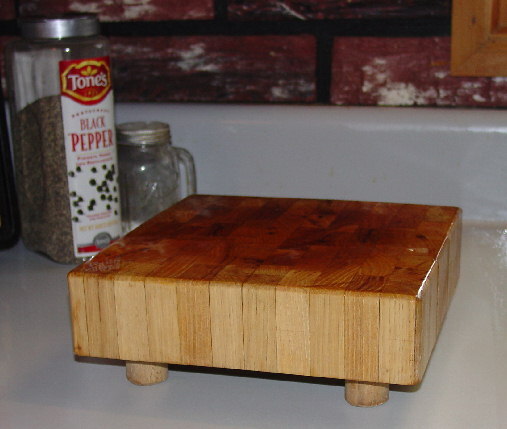 Yet, it was Melly's little cutting board/baby butcher-block that drew my attention. As I stood there and oiled down the old wood, I realized that every time I use my kitchen items, I think of those who gave them to me and cherish those memories and moments. My kitchen is my favorite place in the house for I am surrounded by so many memories—even from our reconstruction of it. I feel safe there with its little z-brick on the walls and the cupboards filled with glass, metal, and food stuffs. My kitchen is full of more than what makes it up, it's full of my family. Thanks Melly for bringing me a smile you forgot. Know I love you very much.